Chinese super center Yao Ming's flawless ability to play has created a buzz. On the court and off, Houston Rockets basketball star Yao Ming is a true giant. The broad shoulders with a stronger back, this sensational 7-6 tall monster created a stir in the NBA and across the globe as a rookie only. At the age of 22, he has become a NBA megastar. Like Madonna or Elvis, Yao needs only the mentioning of his first name and the crowd goes crazy. A sure a sign of superstardom as any. , it always has seemed not enough for him to be the player he is but to become the player he can be. Supposedly, the topic is how great he can be, indeed the discussion will be enormous like him. This spring NBA teams included 65 international players from 34 countries and territories. The diverse product on the court helps attract new audiences around the world. And probably the most significant foreign player to suit up is the Rockets' Yao, but Yao has never preferred talking of himself and his potential for greatness. A true representative of the country which thinks that discussing of one’s greatness is immodest and against the culture. On the contrary he is a harsh critic of himself and is very rigid to himself. Yao has made the NBA a hot offer in the emerging markets of the Far East increasing the commercial value of NBA in Far East. Yao may be the ultimate marketing tool for the rapidly growing Chinese market. 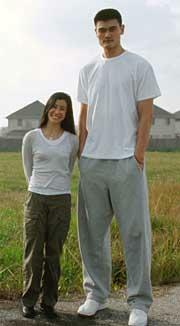 Yao was the first number one NBA draft pick to come from an international basketball league. When Yao is in action, 300 million people watch him intensely.